Please click the individual events to see more details. Parents can synchronize this calendar with their Outlook calendar or various mobile devices by following these instructions. The links for use with various devices are [XML] [ICAL] [HTML] and the Calendar ID is jtw076@gmail.com. For example, iPhone users can just click on the ICAL link to synchronize with this calendar. Parents can download forms here. These forms are fillable PDF files, which means that the information can be typed into the form in a PDF reader (e.g. Adobe Acrobat Reader) before printing it and signing it. 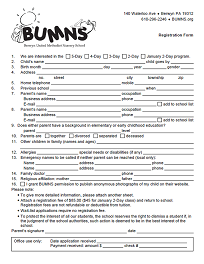 The BUMNS Registration Form is used to register a new or returning student for school. Most often this will be needed in November, but if there is availability BUMNS may accept new students at other times during the year. An application fee is required with the form unless there is no current availability, and the student is to be wait-listed. See below for the current registration fee. The BUMNS Health Form is required to be on file before a child can attend school. Note that it requires record of immunization from your child's doctor. The BUMNS Field Trip Permission will usually be partially filled out by the teachers organizing a field trip, and emailed to the parents of the students included. 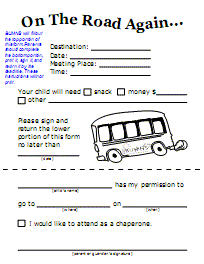 Students cannot attend a field trip without a signed permission form — no exceptions. 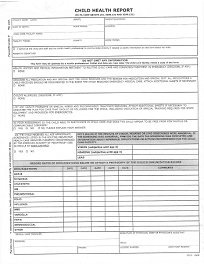 The form is included here so that they are all in one convenient place. A registration fee of $80 ($40 for January 2-Day) is due with the Registration Form. This fee is non-refundable and cannot be applied to future tuition. Payments over five days late are assessed a $15 late fee. Late notices will be sent immediately after this grace period. To reduce paperwork and cost, bills will not be sent. Returned checks will be charged BUMNS' current bank charges. School hours are from 9:00-12:00. Please have your child arrive between 8:50 and 9:05. Please pick up promptly at dismissal. If your child will be absent or tardy, call the school office between 8:30 and 9:00. Children should be kept home for school if: they are too sick to play outside, coughing, running a fever, has contagious disease or an excessively runny nose. No medications, prescription or non-prescription will be administered to a child without a written consent from the parent. All medications will be kept in the office. Play clothes are appropriate. Please label outerwear. Inform the school if you child has allergies. Parents may provide snacks if their child is allergic to school snacks. Children will need a backpack labeled with their name. Backpacks should be sent to school each day. Teachers send communications home through the backpack. Two current, local emergency phone numbers are needed. Emergency phone numbers are used if the parent cannot be reached. Families are assigned a carpool number. We encourage carpooling with neighbors or friends. The carpool number should be displayed in the driver's side window, as you enter from Waterloo. If you prefer to walk in and pick up your child or need to talk to a teacher, park your car and walk into the school. If your child is going home with a different driver, the child will need a signed permission slip from the parent. We will not allow a child in another car without written permission. During inclement weather, we will abide by the decisions made by T/E School District. T/E is #854 on KYW 1060, or call the T/E voice mail for closing information: 610-240-1970. If T/E has a two-hour delay we will have a one-hour delay. Birthdays and 1/2 birthdays are celebrated. Parents provide their child's favorite snack for the celebration. It is our tradition that children donate a book to the class library on their special day. Field trips are a part of our educational curriculum. Each child must have a signed permission slip to participate. Parents are chaperones with the teachers. If a parent is unable accompany their child, they must install their child's carseat in the assigned car. Show n' Tell will be on a day assigned by your child's teacher. Encourage your child to participate. No weapons, please. We ask that children not bring toys on other days; the toy may get lost or broken. Kids in Motion is a weekly physical education class. Each class wil have an assigned day. Sneakers must be worn. Girls are encouraged to wear shorts or pants for comfort. A recent picture of your child to display above their coat hook. A change of clothing (include socks and underwear) placed in a large Ziploc bag. Write your child's name on the bag. 3-, 4- and 5-Day children only: a box of tissues.